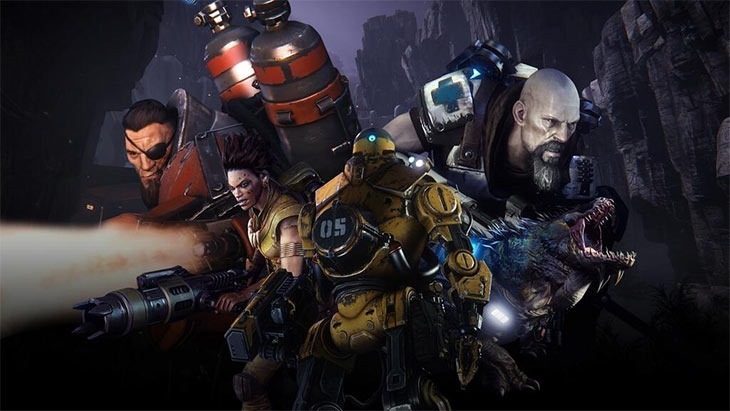 Last week, we told you about the new classes that 2K and turtle Rock have revealed for their upcoming multiplayer shooter, Evolve. Joining the cast we discussed in our preview, we have a bunch of new hunters to help capture the alien. Here’s an insider view, from the folks at Turtle rock, explaining the new classes, how they work – and how you can mix and match with the old crew for the best monster-hunting experience. Hyde is the new assault class, wielding a minigun that does heavy damage, along with a short-range flamethrower. He’s also go toxic grenades, that create a poisonous cloud of gas to deter the monster. The new Trapper, Maggie has a machine pistol and harpoon traps that are great for reeling the monster in and keeping it immobile. She’s got a pet called trapjaw, a dog that’ll help the hunters sniff out the alien. the dog is also able to revive teammates, which changes the game’s dynamic quite a bit. The new Medic is named Lazarus and is what Turtle Rock calls “the opposite of Val.” He can bring his teammates back from the dead with the Lazarus device, which means that like VAL, he is essential to the team’s longevity. He’s got a silenced sniper rifle so he can attack from afar, and a personal cloaking device to keen him unseen. Lastly is Bucket, the robotic hunter. He can remove his own head and use it as a UAV for surveillance purposes, which unfortunately leaves his body stationary. when he is an active combat participant, he packs a punch with a laser-guided missile launcher and sentry guns. Neat. Not having a head puts Bucket at a disadvantage, naturally. The bot’s body remains stationary, leaving him vulnerable to attack from the monster player or lesser, but still dangerous creatures roaming the map. In combat, Bucket is pretty effective, thanks to a laser-guided missile launcher and flying sentry guns that pop out of his robot gut. In this video, the developers also talk about the new map, which and the NPC monsters that’ll keep each experience fresh and entertaining. I’m no fan of shooters – especially those with a pure multiplayer focus – but my time with Evolve has left me wanting more. Every time they show something more, we see more of the game’s depth – and it’s something I can most definitely see myself jumping in to for regular co-op action. It’s out in October for PC, PS4 and Xbox One.